This week we present more from the Scoil Éigse 2006 Tutors at Fleadh Cheoil na hÉireann. 00:00 A concert flute and fiddle duet by Louise Mulcahy (West Limerick) and Oisín MacDiarmada (Sligo), as they play a selection of reels. Louise and Oísín were tutors at Scoil Éigse 2006. 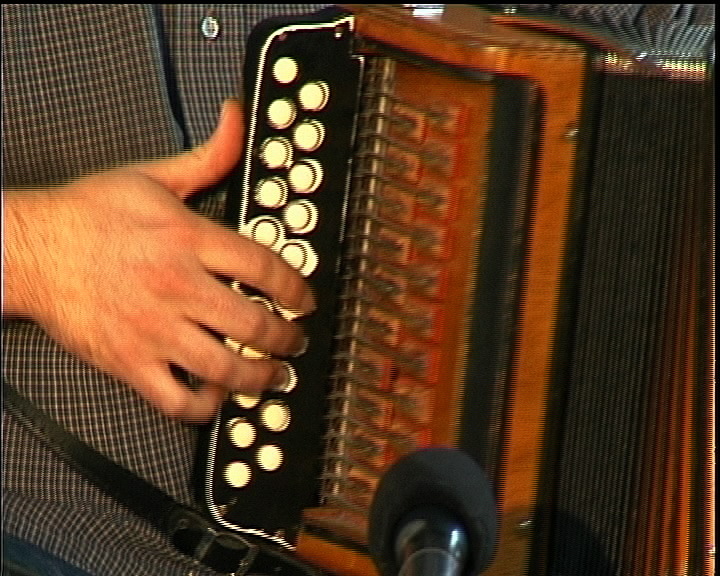 03:33 A selection of flings played by banjo player Angelina Carberry and button accordionist Martin Quinn from Armagh. Angelina and Martin were tutors at Scoil Éigse 2006. 06:33 A selection of reels, “The Chattering Magpie” (which is this week’s Tutorial) and “The Wise Maid” played by Sara Jane Woods (Dublin) on concert flute and Seamus Gibson (Donegal) on fiddle. Sara Jane and Seamus were tutors at Scoil Éigse 2006. 09:44 Uilleann piper Brian McNamara from Co. Leitrim plays a slow air: “The Bright Lady”. 13:57 A group of five of the Scoil Éigse Tutors play a selection of Sligo Polkas called “The dark-haired girl dressed in blue” and “The Ballinafad Polka”. The musicians are Aoife Granville (Kerry) on flute, Tarlath Brennan (Sligo) on banjo, Mona Walsh (Kerry) on concertina, Marie Walsh (Galway) on accordion and Ann-Marie Acosta (USA) on piano. 16:41 A selection of reels ending with “Mulhaire’s” played by a group of nine of the Scoil Éigse tutors as follows: Front Row (L to R): Nóirín Ní Shuilleabhain (Whistle), Kathleen Nesbitt (Fiddle), Connie O’Connell (Fiddle), Nickey McAuliffe (Fiddle), Paddy Ryan (Fiddle). Back Row (L to R): Anne McAuliffe (Flute), Maeve Ní Locklainn (Concertina), Sióbhán Ní Chonnaráin (Flute). Piano: Maria Lynn McHugh.